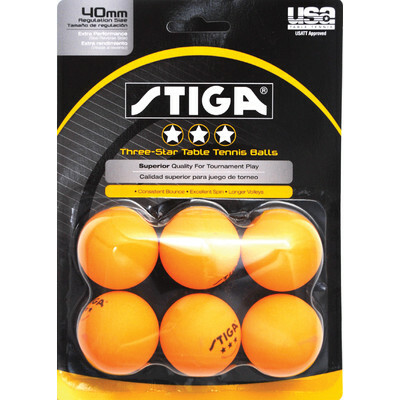 Stiga® Insta-Play Table Tennis Table stands true to its “Insta Play” name and lets you take the first shot right out of the box as it requires no assembly. It has a ¾-inch smooth surface top with edge banding and striping. The steel apron paired with steel legs provides maximum support during intense play, while corner pads help avoid snagging. The Stiga® Insta-Play table tennis table comes with a 66 inch net and post system. Solid 3" ball-bearing casters make it easy to roll and move the table to the desired location. You can also do a playback when you do not have a partner to play with. The tables folds well and easy for convenient storage. Most of the buyers say that the box is very heavy and needs another pair of hands for the transport. Well, that is the cost of convenience of buying a pre-assembled table. Overall, Stiga® Insta-Play Table Tennis Table is a great table for playing at home with friends or for competing with a professional player. Buyers love this table and find this worth the extra cost. 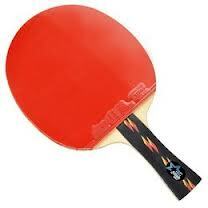 DHS Table Tennis Racket (Ping Pong Paddle) - Shakehand is recommended for beginners to intermediate players. The racket is made of 7 Ply Pure Wood, light and tough wood body and imported wood face layer. Front side rubber is Hurricane II Pimples In and the reverse side is Black G888 Pimples In. The long handle is flared and well fitted with a rubber. The paddle is sticky enough to deliver the ball in express speed and good spin, which helps in improving the game. It is easy to clean the racket by simply sponging it with warm water and storing it in a pouch when not in use. However, many users complained about the foul rotten fish smell when the racket is newly openly, but it fades away quickly. Some users mentioned about the cheap quality rubber used, as it tears up after few months. However, many users complained about the foul rotten fish smell when the racket is newly openly, but it fades away quickly. Some users mentioned about the cheap quality rubber used, as it tears up after few months. The paddle is very sticky and attracts dirt, dust and debris which will eventually affect the spin. Also, the racket is heavy in weight and strenuous if used continuously for long hours. Overall, the DHS Table Tennis Racket, Ping Pong Paddle - Shakehand is one of the most desired branded racket, at an affordable price for Table Tennis players. 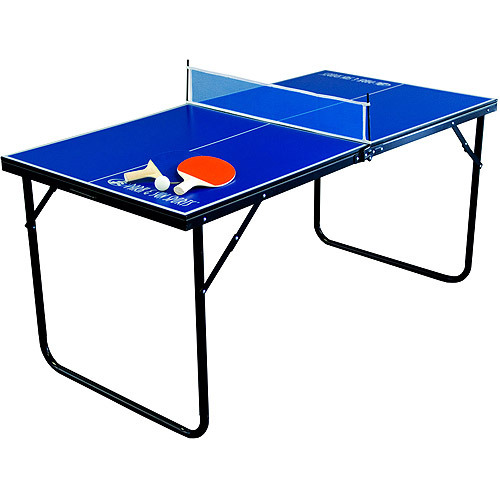 JOOLA Midsize Table Tennis Table is a great table for lovers of Ping-Pong who are tight on space. Only 2/3rds the length and width of a regulation table, but standing at 76 cm (regulation height), the Midsize is still big enough to feel like a real table tennis table! This good quality table breaks down into two separate foldable halves that can easily be stored away in a closet! To further justify this purchase, each half is nearly a perfect square and perfect for card games! Many buyers complain about the poor packaging of the table and receiving damaged product. Mainly, corners of the table break during shipping. Also the net and net hardware was missing in many shipments. 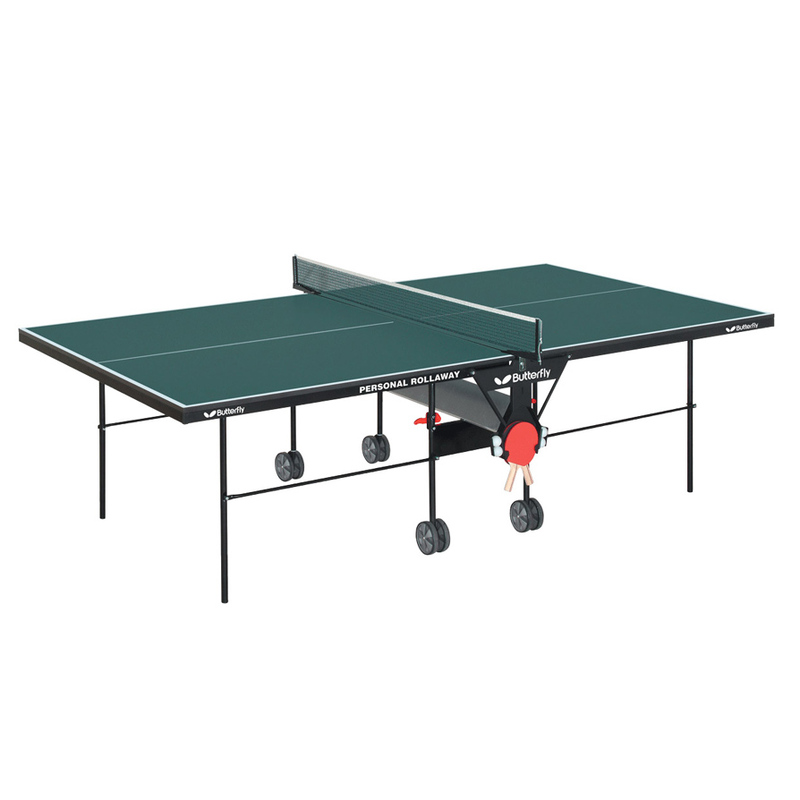 Overall, JOOLA Midsize Table Tennis Table is a good and fun table for anybody who is tight on space but still want to challenge friends, family or housemates to a friendly game of ping pong. Butterfly Personal Rollaway Table Tennis Table boasts a robust design and good quality providing excellent bounce to the ball. Large 5" double wheels, partnered with the side beams and 1 1/2" steel rim, provide for the highest level of performance in this price-range. The table is easy to assemble but takes about 4 man hours to put together. The legs are indented from the ends and sides of the table for unhindered footwork while playing. The table folds into the playback and storage positions without removing the net and post. It also comes with paddle and ball holders on the side. Some reviewers found the instructions to be not so good making assembly more complicated. Many players complain about the big gap between wall and net in playback position. 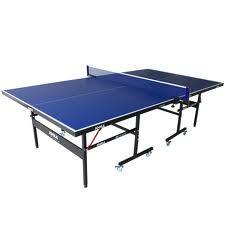 Butterfly Personal Rollaway Table Tennis Table is perhaps the greatest value in the line of playback tables. It is great table for playing at home or recreational leagues. Stiga Classic 4-Player Table Tennis Racket Set is suitable for hobbies, leisure time, recreational play or beginners for a doubles play. The red and black colored rackets are made of 5-ply and straight handle. The pips-out surface offers a better ball contact, slower shots and more strategic game. The set includes 4 classic hardbat style rackets and 3 Stiga One-star Ping-Pong balls. However, many users warned about the poor quality of the entire set. In some cases, the balls tore easily and the rubber on the rackets peeled off within few hours of play. Some users also mentioned the surface of the paddle chips within few days. The ball does not bounce and it is difficult to hold the racket due to the short handle. 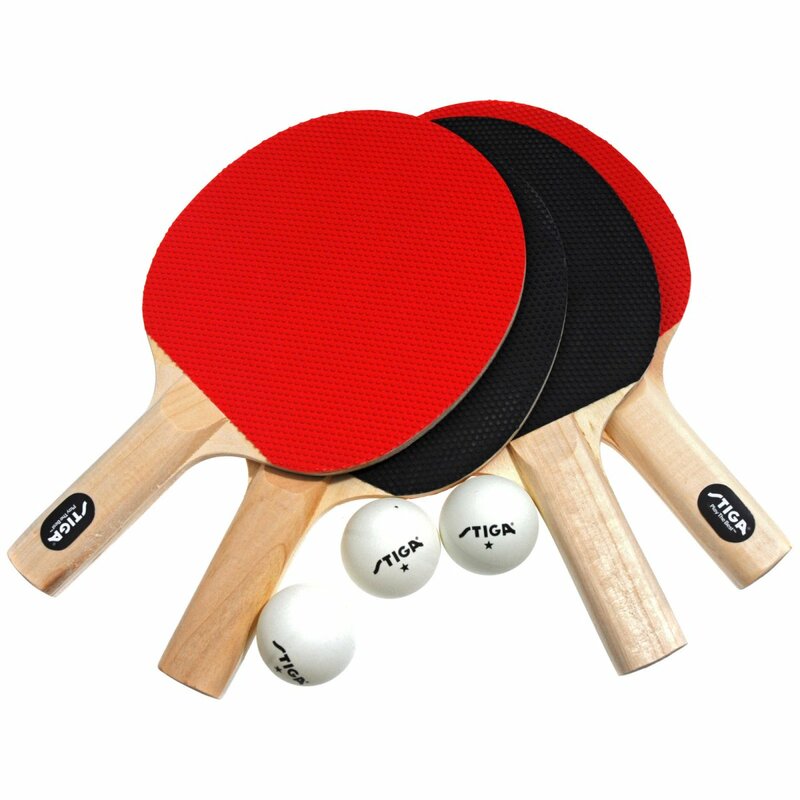 Overall, the Stiga Classic 4-Player Table Tennis Racket Set offers an average quality and utility for individuals looking to start learning and practice. 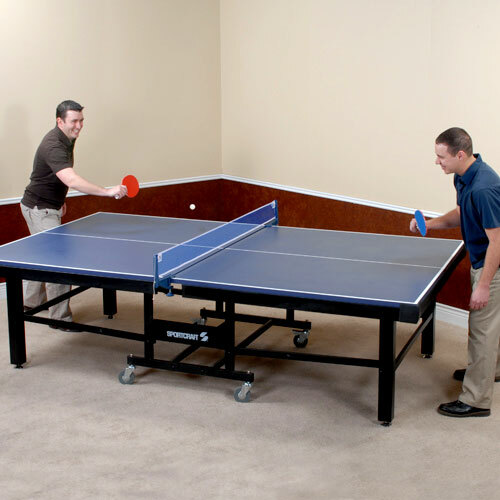 Sportcraft Marquis 2pc Table Tennis Table is the perfect item for any home or recreational game room. 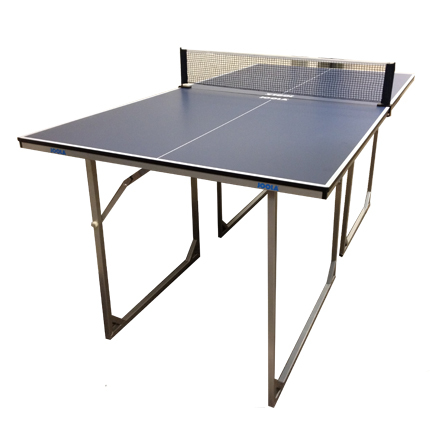 This table tennis table features a 1 inch thick laminated play surface for a truly professional bounce. The smooth rolling deluxe lockable casters and heavy duty frame are only a few of the high end qualities that set this table apart from the rest. The Marquis table tennis table comes complete with a high end blue net and post set and has tournament size two piece 9’ x 5’ tables. Extra-large post style legs are very study and stable. The table also folds easily for playback and storage options. This table tennis table does require considerable set up and is pretty heavy to lift up when in box. Also some buyers complained about the missing part in package and replacement parts take time to arrive. 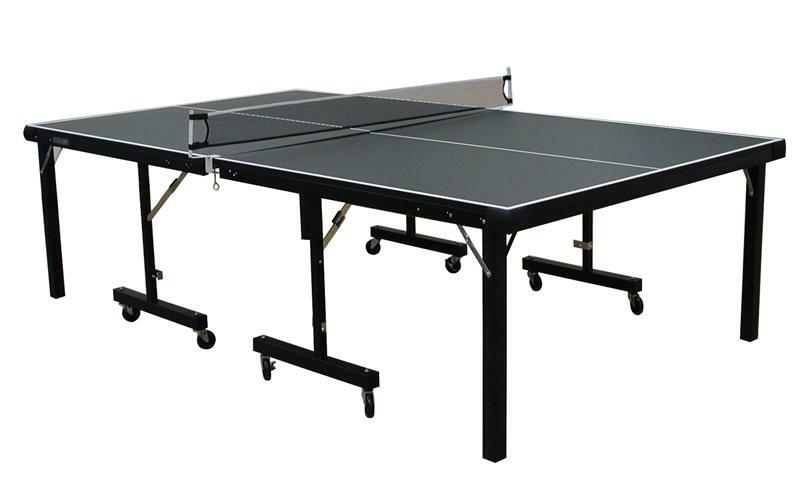 Overall, Sportcraft Marquis Table Tennis Table is great table for its good quality at low price. 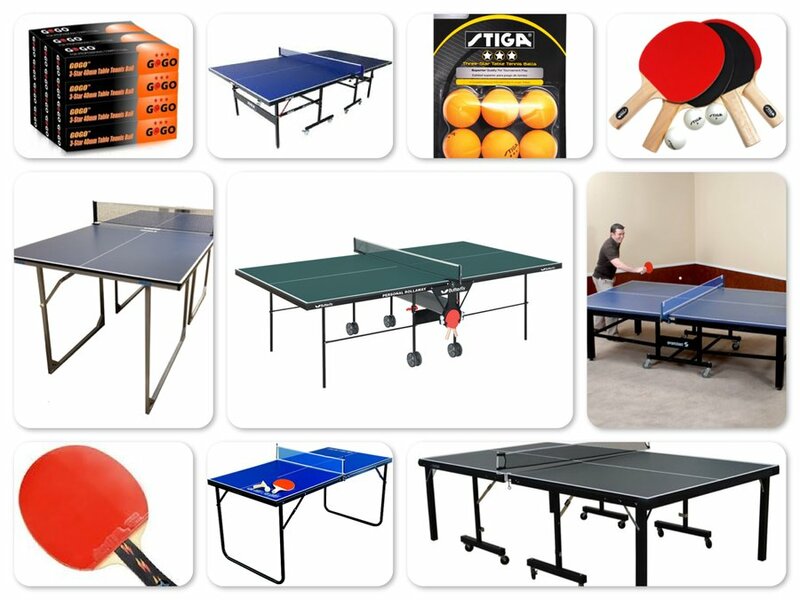 It is a perfect table for home play or recreational leagues. 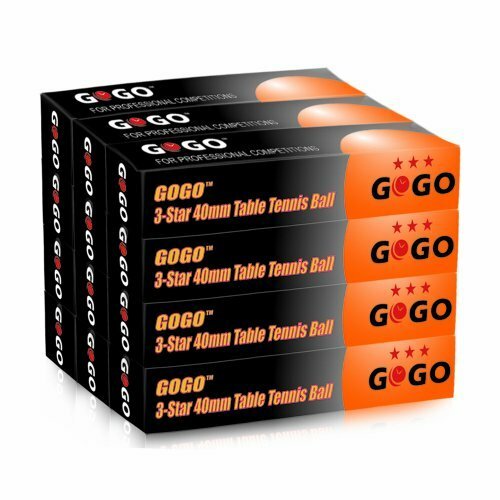 Park & Sun Mini Table Tennis Set is a good table for the people who love ping pong but do not have the space for a full-size table. This compact and lightweight table minimizes the playing surface without compromising the fast-paced action. This table features a steel frame with black powder-coated finish and a 3/8"-thick laminated playing surface in cool blue. A folding design with Velcro lock and carry handle makes it easy to store or take with you. It is very easy to assemble and setup. Many reviewers complain about the short wood screws which attach the table top to the frame. These screws tend to get loose and fall off. Also the playing area stays outside when the table is folded. Many reviewers complain about the short wood screws which attach the table top to the frame. These screws tend to get loose and fall off. Also the playing area stays outside when the table is folded. This increases the chance of table top getting scratched and damaged. All in all, Park & Sun Mini Table Tennis Set proves the point that small can be smashing. The smaller playing surface demands quicker reflexes, more precise shots, and more intense game play. It is a good table for recreational indoor and outdoor play. If you are a pro player, this set is not for you. Dimension: 60" x 30" x 28"